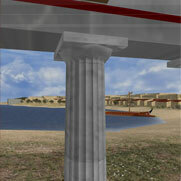 The actress, the personification of Miletus, crosses the Ionic Stoa. The actor wanders around Miletus. Panoramic view of the northern part of the city. The Delphinion, Capito Thermae, Palaestra, Gymnasium, Ionic Stoa. Panoramic view from the east. Capito Thermae and Ionic Stoa. Faustina Thermae. Panoramic view from south to west. Faustina Thermae. Apodyterium. Hall of Muses and caldarium. The Apollo Sanctuary at Didyma. Colonies of Miletus in the Black Sea. Bouleuterion. The propylon and the atrium facing north-west. Bouleuterion. Detail of the external (eastern) face of the propylon. Delphinion. General view of the open-air temple with a view to the west. Delphinion. Partial view of the open-air temple: the Archaic altar, the inscribed stelae and the circular monopteral building. Delphinion. Detail of the inscribed stelae. Hellenistic Gymnasium. View of the Palaestra and the main building. Hellenistic Gymnasium. View of the eastern stoa of the Palaestra and the main building. Hellenistic Gymnasium. The external (southern) face of the propylon. Hellenistic Gymnasium. Partial view of the main building and the Ephebeion. Theatre. View of the koilon and the orchestra. Theatre. The facade of the Roman stage building. Theatre. Staircase to the west parodos. Grattius Monument at the Harbour of Lions. In the background, the Harbour Stoa. View of the Stadium in Miletus.